After realizing the flower skirt was so cute, I ordered this basic black skirt. 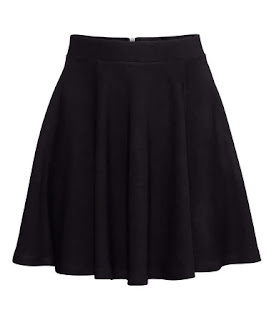 Very simple and basic, but that's the beauty of this skirt. Because you can wear a funky and colorful top with this skirt. It's from Divided and it was 14,95. I ordered it online and had to pay forwarding charges. So I'll have to pay 19,85 euros. I don't have to worry about the size, because it's the same skirt as the flower one. I only have to wait for it to arrive, it might be in at the end of December or the beginning of January. But you never know with the H & M! It might come sooner. This is a nice skirt! I like that it's flowy. I have to wear skirts everyday to work, I'll have to check out H&M. Thanks!